First, we need to define and measure “tenure security.” This can be especially challenging to do for women, who often access land through their fathers or husbands. Although many surveys rely on land documentation to proxy tenure security, experts increasingly agree we need to also measure perceivedtenure security, as reflected in indicators 1.4.2 and 5a of the Sustainable Development Goals (SDGs). One way to do this is to ask landholders whether they are concerned someone (like a neighbor or an outside elite) could confiscate their land. Since women face legal and cultural barriers to inheriting land in much of Africa, it is also important to ask landholders if they plan to bequeath their land to their wives or daughters. A comprehensive review found women’s tenure is less secure than men’s according to various indicators, ranging from documented ownership to involvement in decision-making. But when we consider perceived tenure security – measured by fear of land confiscation – the picture is somewhat different. Research I led previously found that female household heads in Ethiopia and Zambia felt more secure than male household heads, and my colleague Markus Goldstein found similar trends in Ghana. Of course, women who head their own households are not representative of all women in a community, so we need to go beyond simple comparisons of male and female household heads to understand women’s tenure security. While some female household heads (widows or divorcées) may be more vulnerable than the average woman, some may have higher social status, allowing them to control land independently. For example, in Uganda, the World Bank is evaluating the government’s efforts to incentivize joint registration of land held by married couples, including through subsidies that are conditional on joint registration and targeted communications. Fully 40% of households were willing to jointly title their land without incentives, increasing to 70% with incentives. In Benin, where the government is demarcating village boundaries and certifying farm plots, another World Bank evaluation showed this closed the gender gap in fallowing – which is important for maintaining soil fertility. Preliminary results indicate beneficiaries plan to bequeath more land to their daughters and wives and that female household heads were more likely to retain their land, even after widowhood. Still, many unanswered questions remain that require more nuanced data to answer. For those of us committed to strengthening women’s land rights, this evidence gap poses both a challenge and an opportunity. 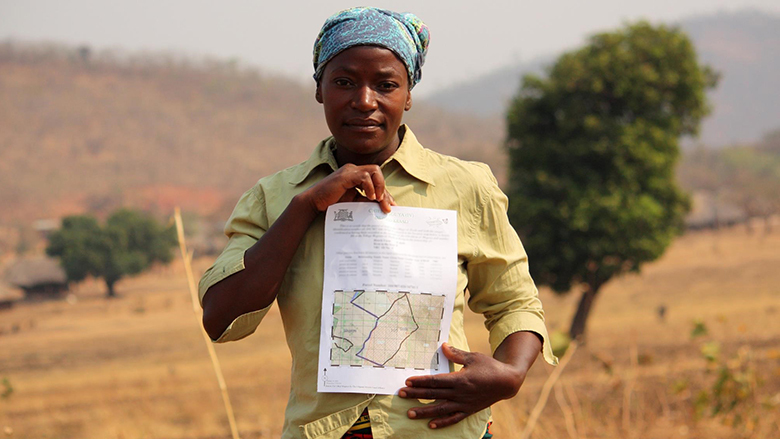 The World Bank is partnering with several governments in Africa to close this evidence gap through rigorous impact evaluations of projects that aim to strengthen women’s – and men’s – land rights in Benin, Côte d’Ivoire, Ghana, Rwanda, and Uganda. With UN Habitat, we are also developing standard methods for measuring perceived tenure security. This blog was originally posted as part of the World Bank's Voices: Perspectives on Development blog series.